Any quality tool can be differentiated to meet the needs of all learners. Here are some examples, which will be added to over time. This activity include 6 task (2 rows of 3 squares). The squares are numbered from 1-6. Usually in groups of 2-4, students collectively choose tasks in any order of preference to complete. Option 2: Make an aligned new copy based on the first version. The new copy is a different level of complexity. 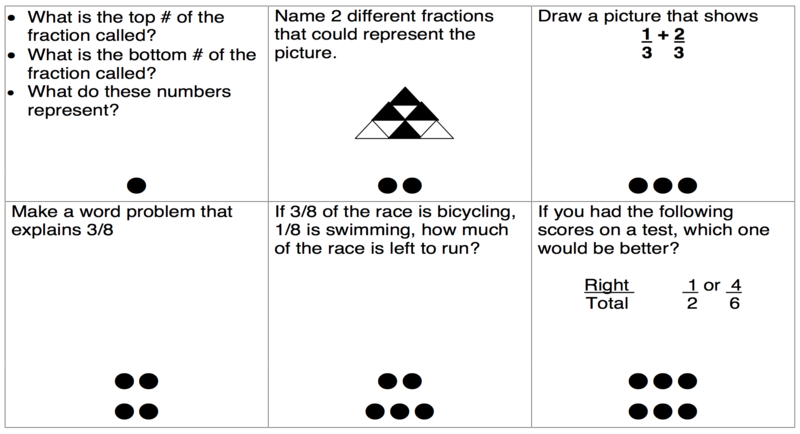 Allow for learners to complete the tasks in a random order. Or, let students complete 3-4 of the 6 tasks, so long as the experiences will meet the learning outcomes. Use at least 3 different learning preferences in different tasks. For example, some tasks are visual and practical, while others are abstract and auditory. This activity can include as many task cards as desired or needed. Similar to Think Dots, except that each square is on a separate card, and there can be more or less than 6. They are usually kept on a key ring or wrapped in a rubber band. Depending on directions, learners (individually or in small groups) work through the cards in sequence or random order. Option 1: Make each card progressively more challenging. Allow for learners to complete the tasks in a random order. Or, let students choose how many of the cards in the collection to complete, so long as the results would attain the learning outcome. Use at least 3 different learning preferences in different task cards. This tic-tac-toe format of 3×3 or 4×4 includes tasks in each square. Some rules require completion of 3 or 4 in a row. My preference is requiring completion of either one per row or per column. May be completed individually or in small groups. Option 1: Set each row or column of options at different levels of complexity. Some students may be assigned specific row or column based on their need. Or, have students do one task per section so that they are exposed to gradually more complex tasks. Option 2: Another option is to create a new copy of this activity for a different groups to work at their challenge needs. Based on collected data from student surveys include tasks based on real world interests and experiences. The structure of this activity gives students the power of choice. This inherently supports interests. Just be sure that the options are ones that they care about. Use at least 3 different forms of learning preferences into the development of the tasks. Allow students to choose the tasks if they appeal to them because of learning preference or interest. The two can intertwine. Centers or stations are set up with different tasks. Learners move through each location to complete the work. In this case, the assignments are embedded with 3-D Instruction experiences. At each station, include different sets of tasks that reflect the supports and challenges that each group of students need. Many teachers put the tasks into color folders (physical and digital), and assign students to the color for the leveled work. It’s best to change the color coding each time. Students have choice on which stations they go to do the tasks. Another approach is for students to choose which tasks at the center that they wish to do or not do. Build learning preferences approaches into the tasks at the stations. For example, there may be hands-on, recording of data, and audio clips to listen to or create. Learners may be required to do all of the tasks regardless of the learning preference exposure, or they might have the option to choose (Interest) which one’s they want to do.